Mitt Romney’s complaint that lots of people pay no federal income tax has become a familiar conservative lament over the past few years. But how did this become such a staple of tea party conservatism? Here’s a case study that gives us a clue. A more parsimonious explanation is that cohort replacement and a lack of a sense of history is doing all of the work: many of today’s Republicans are unacquainted with the case for the EITC and the child tax credit and the exclusion of Social Security benefits, or they fail to connect these initiatives to the narrowing of the tax base. This isn’t a sinister plot. Maybe. But let’s do a quick history review first. Back in the ’60s there was a groundswell of support for a negative income tax, a concept that held some appeal as a simple mechanism that could replace the complex alphabet soup of existing New Deal and Great Society anti-poverty programs. But Mr. Great Society himself, Lyndon Johnson, objected to it because it doled out money even if you weren’t working. (FDR probably would have opposed it for the same reason.) Republicans agreed that it undermined incentives to work, and the NIT died. However, after several years of political haggling, Sen. Russell Long (D-La.) won passage of the EITC in 1975. Because it was available only to those with earned income, it provided a positive incentive to work and enjoyed bipartisan support. It was made permanent in 1978, again with bipartisan support. But then things changed. 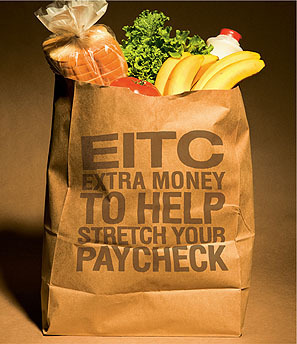 EITC was expanded in 1986 with support from Ronald Reagan but with far less support from congressional Republicans, most of whom fought the expansion. Another expansion in 1990 enjoyed even less Republican support, and in 1993, when Bill Clinton included a further expansion of EITC in his budget bill, it passed with no Republican votes at all. It was at this point that the EITC became associated exclusively with Democrats, and after the Gingrich revolution of 1994 the EITC became a frequent target of attacks from the GOP. House Republicans pushed for major cuts, and Clinton eventually managed to buy them off only by setting up a special $100 million IRS fraud unit targeted specifically at the working poor. The EITC hasn’t been a bipartisan program for a long time, and its current sorry state within the GOP isn’t just due to youngsters who have forgotten their party’s past. As the EITC’s history demonstrates, for the past several decades the core of the Republican Party has simply become steadily more hostile toward the working poor. They’re no longer fellow citizens who deserve some help as long as they’re willing to work, they’re parasites who are mooching off the sweat of the productive classes. You can decide for yourself if this is sinister or not.